During the winter, Lexington homes are sealed up tightly to keep heat inside. While you’re depending on your furnace for heating, the system may be harming your indoor air quality this winter, which can cause a host of comfort and health issues. Your furnace could be malfunctioning, causing these issues, even if it’s heating your home just fine. If your furnace isn’t maintained each year, it’s probably emitting more pollutants than a well-maintained unit would. These pollutants enter your home, diminishing the quality of air you breathe – especially in the winter, as homes are sealed to retain heat and energy. A malfunctioning furnace may produce excessive moisture as it heats air for your home. This throws off balanced humidity in the home, and moisture can increase pollutant concentration, cause mold growth, and exacerbate allergy symptoms. Carbon monoxide is a natural component produced by combustion, and in minute amounts it is harmless. It’s typically vented outside of the home from the furnace, where it poses no danger to you. Furnace malfunctions can cause carbon monoxide to enter the home rather than exit via ventilation, where a buildup of this byproduct can be deadly. Many of the furnace malfunctions which diminish air quality are maintenance-related. While we recommend maintenance prior to heating season, it is beneficial when performed anytime once per year. Changing air filters regularly throughout the winter will improve circulation and reduce pollution inside. Check your furnace’s ventilation throughout the winter to ensure all combustion byproducts are exiting the home properly. 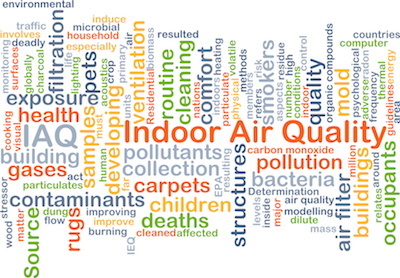 If you’re suffering from poor indoor air quality this winter, your furnace could be to blame. Call Climate Control today for a thorough furnace inspection and solutions to restore great air quality inside.